A YouTuber and tone aficionado by the name of Millstap has spent the last 10 years making videos documenting the tone, setup and effects of Hendrix and stylistically related artists like Robin Trower and Stevie Ray Vaughan. Needless to say, he’s nailed it on more than one occasion, but a particularly impressive video is his demonstration of an original ’60 Fender Bassman, also known as Marshall’s grandaddy. Is this the perfect Hendrix tone? Watch YouTuber Millstap nail Voodoo Chile on a 1960 Fender Bassman. In the video Millstap kicks the Fender Bassman into gear and covers Hendrix’s classic jam Voodoo Chile. The sound is so pure and full of beefy character that you’d be forgiven for thinking it was Hendrix himself. The incredible thing is he uses only the Bassman and a wah, not a single $500 boutique fuzz in sight. 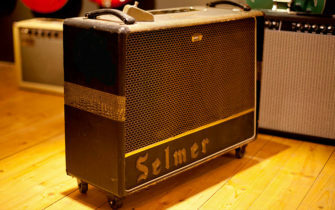 It just goes to show the value of the right amp in creating the right tone, even if it does look like a bail of hay. You’ll notice that millstap doesn’t stop there. He blazes through other classics in his many ‘Sound check’ videos, such as his spot on cover of Manic Depression on #2. The tone-master has gone on to create tone tutorials, song tutorials and even his own effects pedal, the Sabbadius Funky-Vibe. If you’ve been trying to nail that perfect Hendrix sound, this guy is your bible. Check out his YouTube page here, and head below for that creamy tonal goodness.